•Strike the Plunger for Excited Barks, it's Easy and Fun. •Create Excitement in the Squirrel Community. •Locate More Fox and Gray Squirrels. •Great Locator Call - Makes Distress Cries of Young Squirrels. •Creates Excitement-Brings Them Running. •One Call Does It All! •Alarm Barks, Young Squirrel Distress "Whistles", Chatters and Squeals. •Calls Gray and Fox Squirrels. •It's Fun, It's Easy, It's Exciting! Simply tap the bellows part of this call against your leg to achieve realistic squirrel chatter. Used in conjunction with the Penn's Woods Rustle Bag adds a new dimension to the popular sport of squirrel hunting. Works great on predators too! 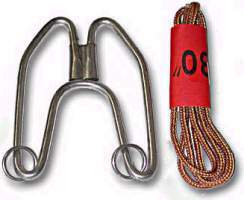 Rubber bulb with metal sound device. Simple to operate. Tap lightly to prduce effective chatter. 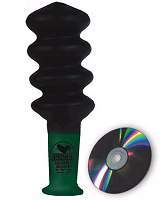 This squirrel call has a rubber bellows with metal sound device. Simple hand-operated call. Produces effective squirrel chatter. 5 calls in 1! Calls both grey and fox squirrels. Comes complete with instructional Mini CD. From the distress squeal of a young squirrel to the chatter of fox and grey squirrel, this call does it all. You won't be disappointed with your selection. Reproduces all five calls of the grey fox squirrel's language: alarm bark, distress scream, grey squirrel chatter, grey squirrel squeal, and fox squirrel chatter. Five calls in one. Reproduces all five calls of the grey and red squirrel's language: alarm bark, distress scream, grey squirrel chatter, grey squirrel squeal, and fox squirrel chatter. 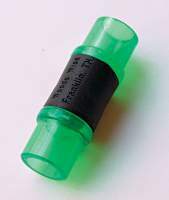 Predator call reproduces the warning bark and chatter of squirrels. Knight & Hale has applied the four-in-one concept to their new squirrel call. This hand operated call includes the bark of the gray and fox squirrel, the gray squirrel's alarm or chatter call and the young squirrel distress call. A useful device that aids in cleaning squirrels. Now you can effortlessly create realistic squirrels locating barks and chatter. 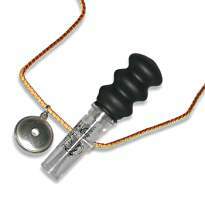 The simplest, best sounding squirrel call available. 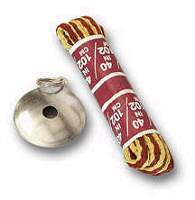 Sounds are created by tapping and pinching the durable rubber bellows. Manufactured by Quaker Boy Inc., so you know it's gotta be good. 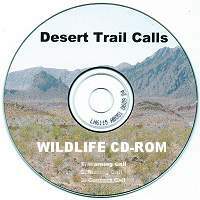 This audio CD-Rom is great for calling coyote and other predators as well as squirrel. Over 60 minutes total playing time.